Here's some startling news for a quiet Friday afternoon. 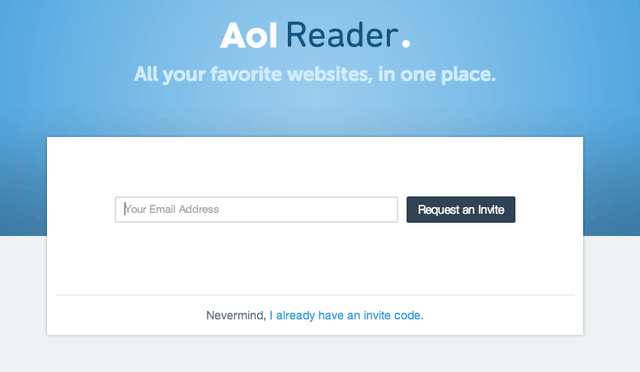 Facebook might not be launching a Google Reader replacement but it looks like AOL is. I've just learned that AOL has a new page up on their website. It's for a previously unannounced service called AOL Reader, and while no one really know what AOL Reader will do I am pretty sure that this is a Google Reader replacement. Update: This news reader is tipped to be launching on 24 June. The sign in page is working, with Facebook, Twitter, and Google supported, but right now the only thing you can do on that page after signing in is request a beta invite. A close look at the page's source code has revealed that the new service will be mobile capable. There will also be ads, and assuming that this is the the reading service I think it is you'll also find sharing options (Twitter, LinkedIn, Facebook, and Google+). AOL Reader marks this tech company's third (at least) attempt to launch a news reader service. AOL was actually one of the first into the niche in 2005 with My AOL, a service which probably died after Google Reader came to dominate the niche. AOL Propeller, which was acquired when AOL bought Netscape, was also launched in 2006-ish but it too died in 2010. I don't know about you but given AOL's past history at developing reading apps I don't think they'll have much luck this time around. P.S. If I missed one or more of AOL's attempts at releasing a news agregator, please feel free to mention it in the comments.